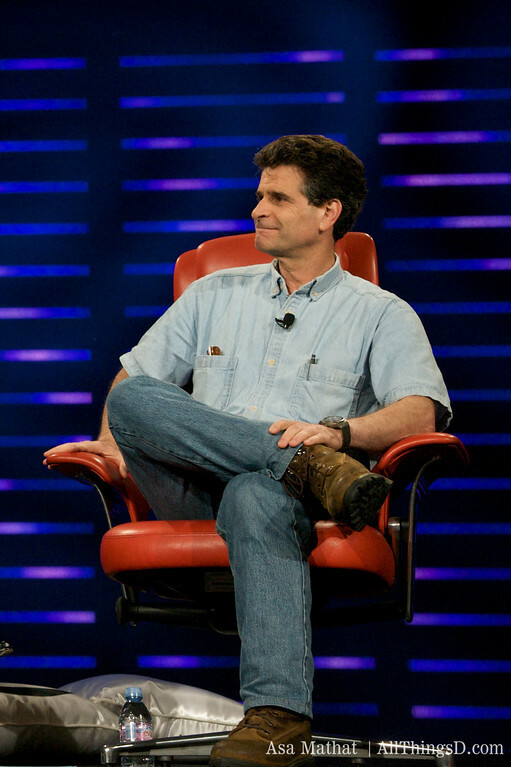 DEKA Research founder and Segway creator Dean Kamen comes to D6 to demonstrate his “Luke Arm” prosthesis. Named after the artificial limb worn by Luke Skywalker in “Star Wars,” the state-of-the-art bionic arm looks and feels to its user like his or her native arm. Walt and Kara welcome Kamen to the stage. So what’ve you been working on? Kamen recalls a visit with some very high-level people from DARPA years ago. The good news, they told him: Battle fatalities have greatly declined. The bad news: Many soldiers that survive battle have lost their arms. And the prosthetics we currently have don’t offer bilateral movement or fine motor control. Kamen says they charged him with developing a new prosthetic that could offer those things. “I looked at them,” says Kamen, “and I said you’re nuts.” We don’t have the technology yet. How do we interface with the human body? “You think you have trouble with the Vista interface,” quips Kamen. Kamen pulled together a bunch of creative folks, did a bit of research and decided to try to build the arm. DARPA asked him to build it in two years. Kamen said he’d build it in one. And almost a year later he had. 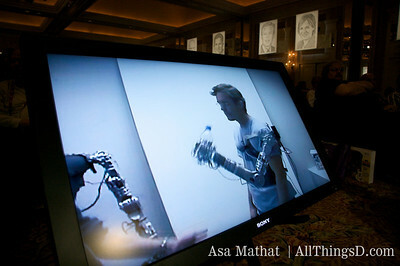 Video of a man with two functioning arms demonstrating an exoskeleton version of the arm. He scratches his nose, picks up a pad of paper …. Kamen queues up another video that features an amputee who’s lost both his arms, using the Luke Arm after less than two hours of training. After passing a small ball to a colleague, the man pours a drink and then feeds himself for the first time in 13 years. Queuing up another video in which a man who has had the arm connected directly to his nerve endings controls the arm simply by thinking. Kamen says it took just a day for the user to learn how to use the arm to do basic things like picking up a glass. Kamen talks about the difficulty of this process–with so many possible degrees of freedom, how does someone wearing one of these arms learn to operate, say, a backhoe? Kamen says DEKA solved this problem by creating macros that could be programmed into the arm to shorten this process. Video demonstration of the “ball holding” and “power-drill operating” macros, among others. We took these things down to a Veterans Administration building to test them out. He found that the arm was difficult to attach because of varying degrees of amputation. Also found that many amputees don’t wear their current prosthetics, because they’re too heavy or uncomfortable or difficult to wear. Kamen worried that the Luke Arm would meet with a similar reception unless he solved these problems. DEKA went back into the lab and added a set of air bladders to the arm harness, along with a pneumatic pump that makes the arm not just more comfortable, but easier to use. Also quite powerful. Can lift weights as large as 40 pounds. Moving on to another video that shows an amputee using the arm to pick up grapes one by one and eat them. Kamen hopes someday to connect these prosthetics directly to the brain–non-invasively. On to the next Kamen passion: education. He thanks Melinda Gates for setting up the crowd, then makes his pitch: We’re the only country where minority kids and women get the message that they aren’t suitable for science or math careers. So let’s turn science, engineering, etc., into a fun sport. In short, he says, we got 23 companies to develop sports-like teams and an annual competition through FIRST (for inspiration and recognition of science and technology). The organization has grown: 13,911 schools from 38 countries. He asks the audience to help.